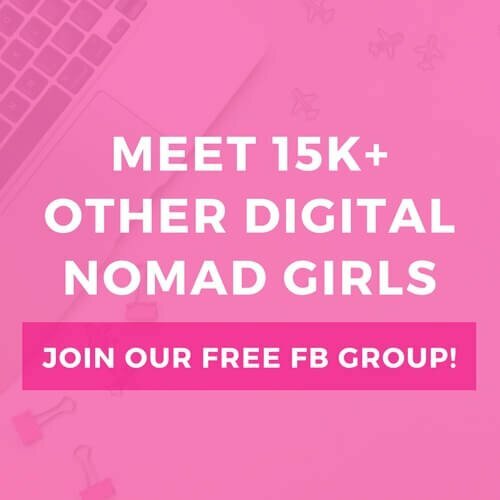 In our DNG interview series, we feature interviews with Digital Nomad Girls from around the world with interesting location independent jobs. 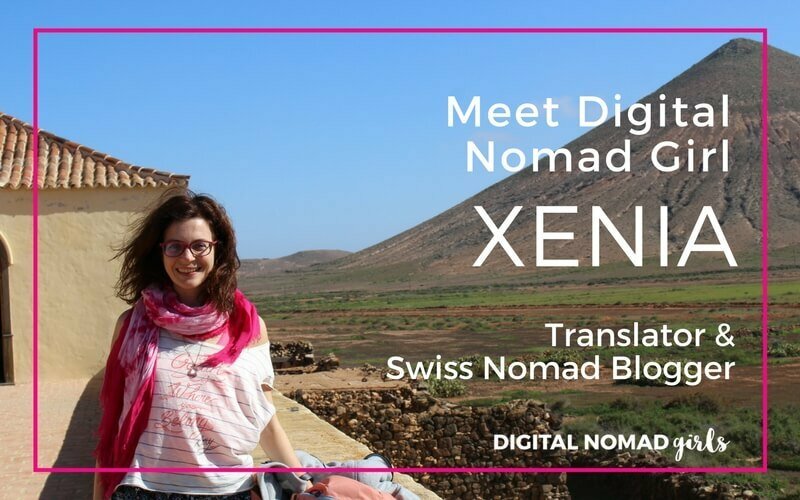 This month we meet digital nomad girl Xenia, online translator and Swiss digital nomad blogger. I was born in Geneva (Switzerland). I have a masters degree in Arabic/History and a masters degree in Translation. I’m turning 40 this year, yay! I’ve been location independent for three years now and I absolutely love it. 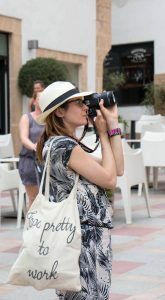 I decided to be a freelancer after a holiday in Fuerteventura (Canary Island). I fell in love with the Island, its beaches and its relaxed vibe. I realised that, being a translator, I could quite easily work remotely and spend the winter under the sun. This autumn I’m in the Cyclades (Greece): Paros, Santorini and Milos. Then, like every winter, I’ll probably head to the Canary Islands. I’m a freelance translator specialised in banking/finance and business communication. I also started a blog in French about Swiss digital nomads. In my country, few people know about this lifestyle. I studied translation at the University of Geneva. You don’t need a masters in Translation to be a good translator but speaking fluently two or more languages is not enough. Have someone experienced proofread your work and give you feedback. Translation requires above-average communication + writing skills and a sense for marketing: understanding what your clients want to say and adapting it to the target audience. As for finding clients, I’d say that networking is key. Well, actually I became a DN before even knowing the concept or knowing that there was a community of DNs out there. 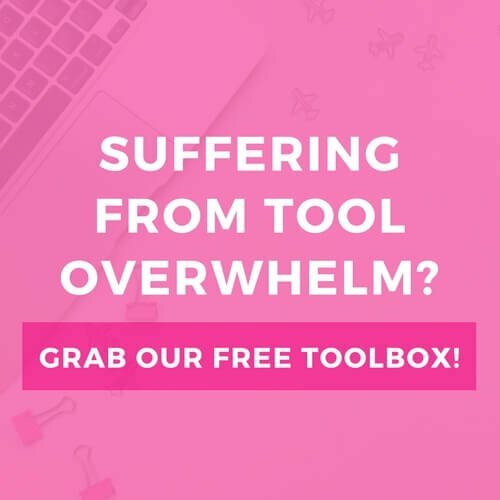 I was kind of old-fashioned and never read blogs or anything like this… I honestly thought I was pretty much the only one out there ;). Then I decided to go location independent because I wanted to live part of the year abroad (more than travel around all the time), preferably in the sun during winter times. Now I’m working on promoting the concept of DN in the French-speaking part of Switzerland. Well, there were… all sorts of reactions. In short, everyone thought it was “extraordinary”, meaning “great” but also “not ordinary” (= “weird”). I think it’s the “logistic” part of it (packing light, finding a comfortable place to work from, finding good wi-fi, etc). I usually go to places where there’s a coworking. It’s easier. If there’s no coworking (like now, in the Cyclades), it’s a bit more complicated: translation is a very demanding job so I really need a quiet and comfortable place to work from. For me, choosing the right destination and then the right place to stay is the most annoying aspect of this lifestyle. I sometimes spend weeks searching for the right spot, and then I book my flights so last minute that they’re much more expensive ;( ! I try to find places with a coworking space. Otherwise, I post messages in FB groups (local groups or DN groups for example). Actually, I have to say that I’m fine with some alone time a few months per year. Plus I started to use Viber and Skype to keep in touch with my friends in Switzerland or abroad. It works really well and it’s quite fun! I’ve been asked this question a few times actually… I think you need to have a plan before starting this adventure while being ready to adapt it and have a flexible mindset. It’s a cool lifestyle but it’s not for everyone. Before starting, you could maybe spend a few weeks in Chiang Mai or in Las Palmas for example and meet DNs there, talk to people, asks questions about their journey as a DN/entrepreneur/freelancer or simply experience the vibe and see if this lifestyle suits you. When I feel lonely, I … Go for a walk and/or have a coffee in a nice place! My favourite digital nomad location is … Corralejo, Fuerteventura, of course! The one item I always pack is ... My good luck charm: three mini-shells in a spherical plastic box. My favourite digital nomad tool/app/resource is … A good old “paper” map! Thank you SO much, Xenia, for sharing your story with us! 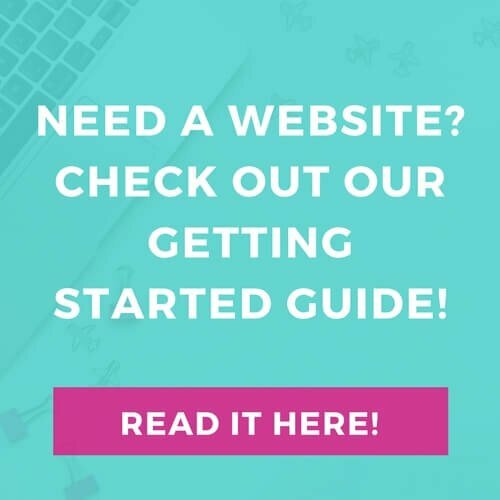 If you want to find out more about Xenia you can check out her website and connect with her on social media.